And wow. All I have to say about this dessert is wow. This is my favorite thing that I have ever made. EVER. And I might say that a lot, but this time I REALLY mean it. 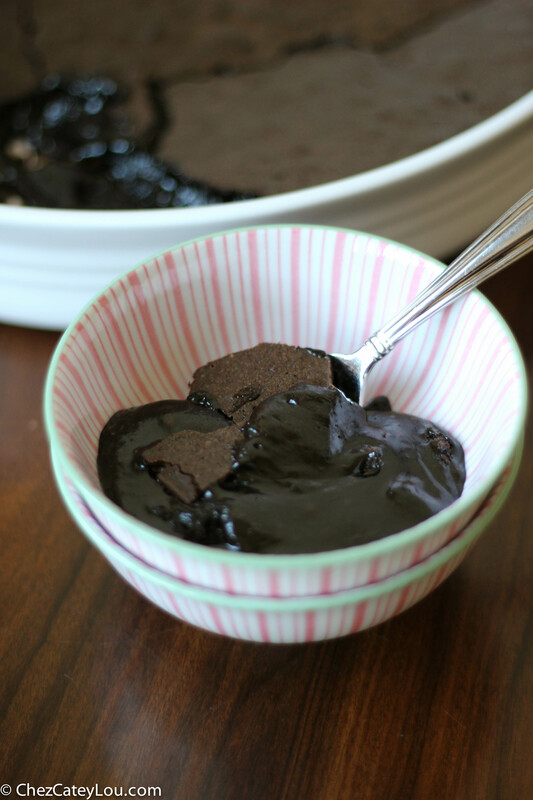 This dessert tastes like warm, gooey brownie batter. 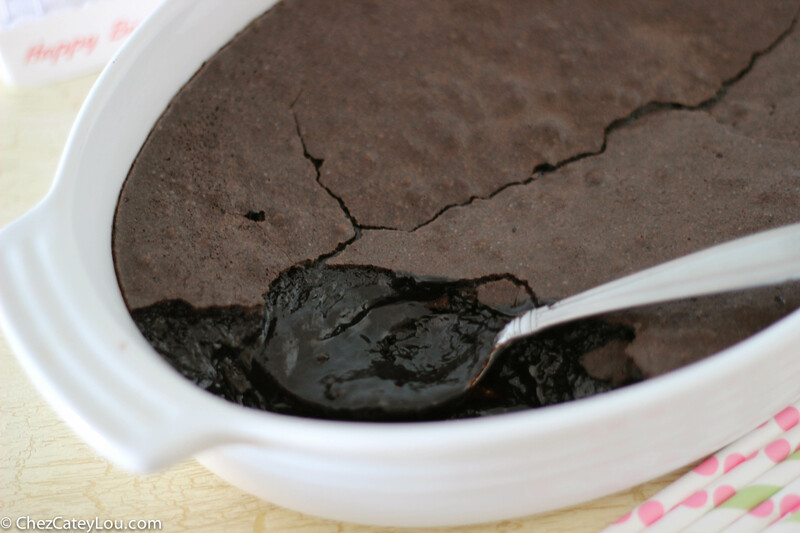 It is almost liquid in the center, the edges have a soft, brownie-like texture, and the top has the signature crispy brownie top. It is a combo of the best textures. And the flavor is unreal! So rich and chocolately, so decadent and delicious. Then if you eat it warm with a scoop of vanilla ice cream – well it just might be the best thing that you ever eat. Anytime there is a molten chocolate cake or chocolate soufflé cake on a dessert menu, I have to order it. 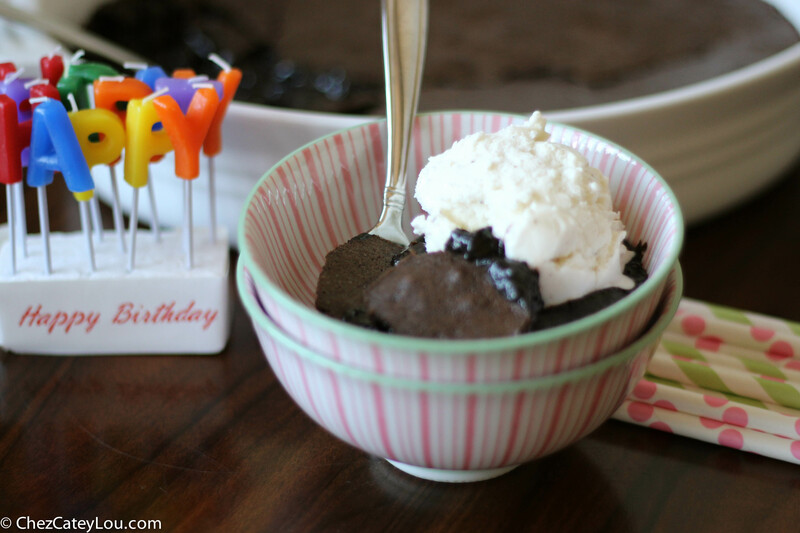 This is like a molten chocolate cake on steroids, so what a perfect birthday dessert for me! I cut into this about 15 minutes after it came out of the oven, because I couldn’t resist. If you let it sit a bit longer, it sets up a little bit and isn’t quite as liquidy as pictures show. It tastes delicious either way, so take your pick! Or have it both ways. I stored the leftovers in the fridge, and this is even good cold. Preheat oven to 325 degrees F. Lightly butter a 2 quart oval baking dish (9x12x2). In the bowl of a stand mixer fitted with the paddle attachment, beat the eggs and sugar on medium-high speed for 5 to 10 minutes, until the mixture is very thick. Sift the cocoa powder and flour together. When the egg and sugar mixture is thick, reduce the speed to low and add in the vanilla bean seeds and the flour mixture. Mix until just combined. Then pour in the cooled butter and mix until just combined. 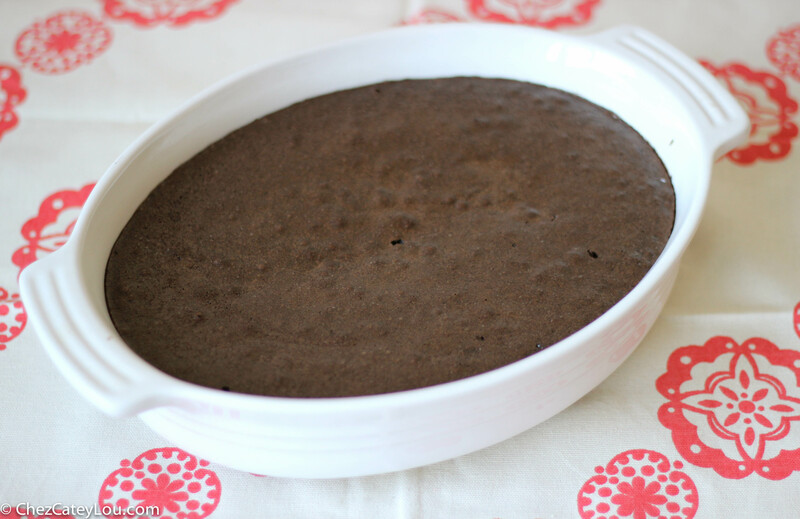 Pour the brownie batter into the baking dish, and place it in a larger baking pan. Add hot tap water to the pan, enough to come halfway up the side of the dish. Bake for one hour. The center will be very under-baked. Thank you so much Dimple! 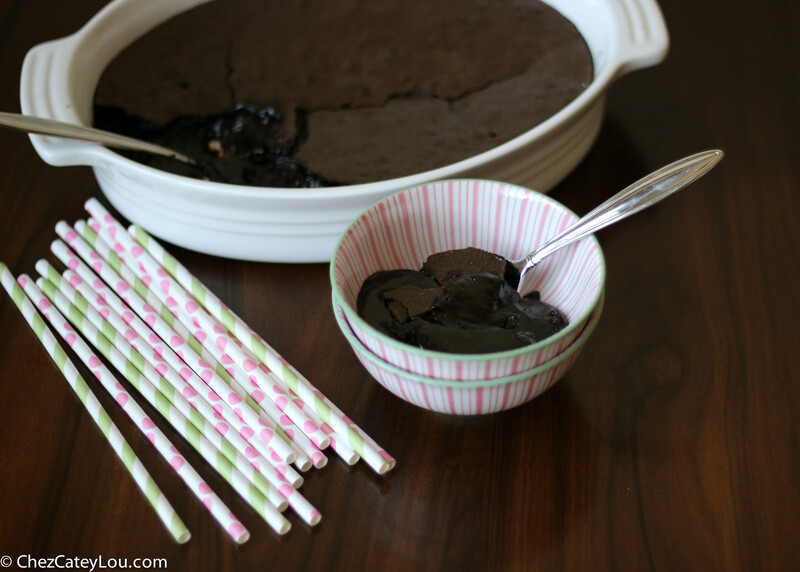 This brownie pudding is definitely worth making and sharing! first of all A Wonderful birthday to you, then OMG that looks delicious ! Happy Birthday! You sure know how to celebrate! We make a version of this for my mom’s birthday every year. Yours is beautiful! 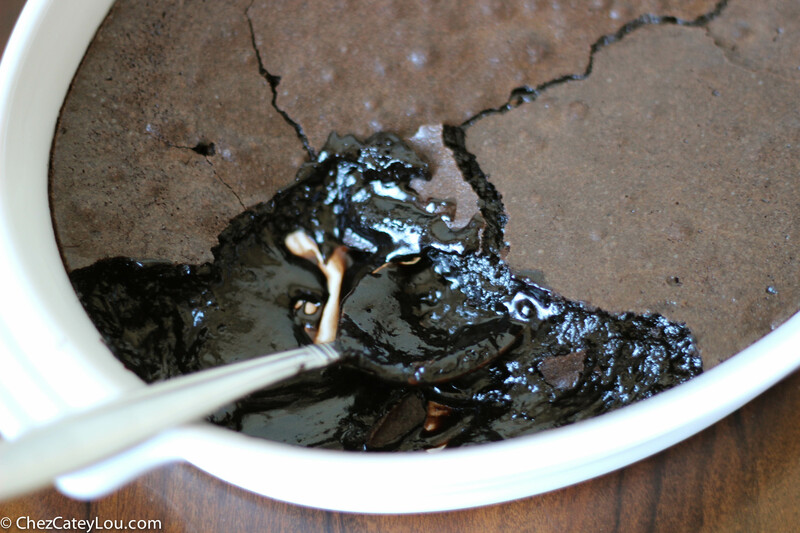 I love how the crust looks so innocent and then underneath is all this melty fudge chocolate. *swoon* What an incredible chocoholic dessert! Thanks, Sinead! It really is soooo good! Happy Birthday! Sadly my next birthday is about 11 months away, but I’m sure I’ll find some other excuse to try this. I never thought I’d be sad about my birthday being a long time away :). Thanks for the birthday wishes, Melissa! 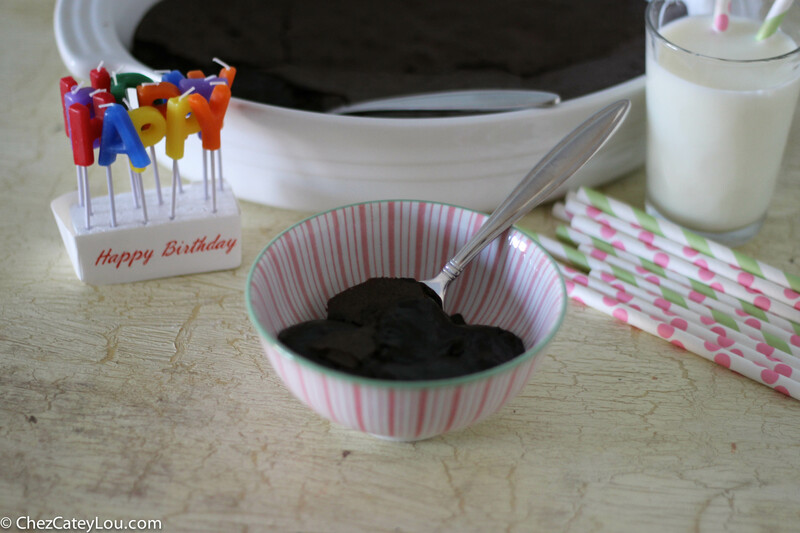 You should find another excuse to make this because it is too good to wait 11 months for! Oh man. My birthday is in a couple of weeks and I think I know what I’ll be making. Happy belated birthday! Thank you so much!! My day was even better than this dessert, which is saying a lot! And side note: love that I came across your blog, a fellow NY food blogger. It’s always great to connect with other NY cooking and eating enthusiasts here in the blogosphere! Thanks for pinning, Chris! I am checking out your blog right now and love connecting with other NYC bloggers!